Ex-cop Jake Ryan wakes up in another world/dimension. All he knows for sure is that he has died. Others who have died and been reborn into this realm go to a city called Hopetown for protection from the terrifying Dark Souls. 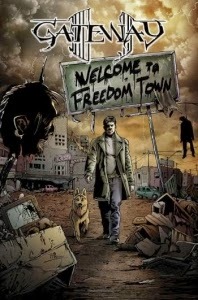 Things are not what they seem in this town so Jake leaves and ends up in a different town controlled by gang members. It turns out he is on a mission as we find out in the course of the story. In some respects this bears similarities to the latest television series on Syfy, "Dominion". Both have a corrupt town that offers "protection" from a fearsome enemy. Unfortunately they both suffer from seeming derivative of other stories. Moyano's style is similar to the early work of Thomas Derenick. Once he gets more experience and lets the art flow it will be much better. At this point in his career his art is too stiff. That's too bad!! The cover art does look really interesting to me. At least you got it through Netgalley!